In My Mailbox is a weekly meme hosted by The Story Siren! Head on over there to see what goodies bloggers received in their mailboxes this week. 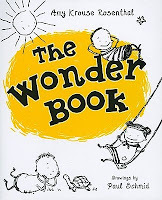 And I got a copy of The Wonder Book by Amy Rosenthal (HarperCollins, March 2010). After a quick glance through it, it looks like it'll please Shel Silverstein fans (of which there are many at my library). And that was my mailbox this week! Did you get anything interesting in your mailbox this week? ROA looks so good! I really need to read some of Simone's books, I always hear rave reviews of them. Rules of Attraction looks good. I still have the first somewhere in my TBR stack which you added to this week. Thanks again! Happy reading! I really like the cover of Rules of Attraction. Have a great week! Rules of Attraction looks interesting. I can't wait to hear your thoughts.